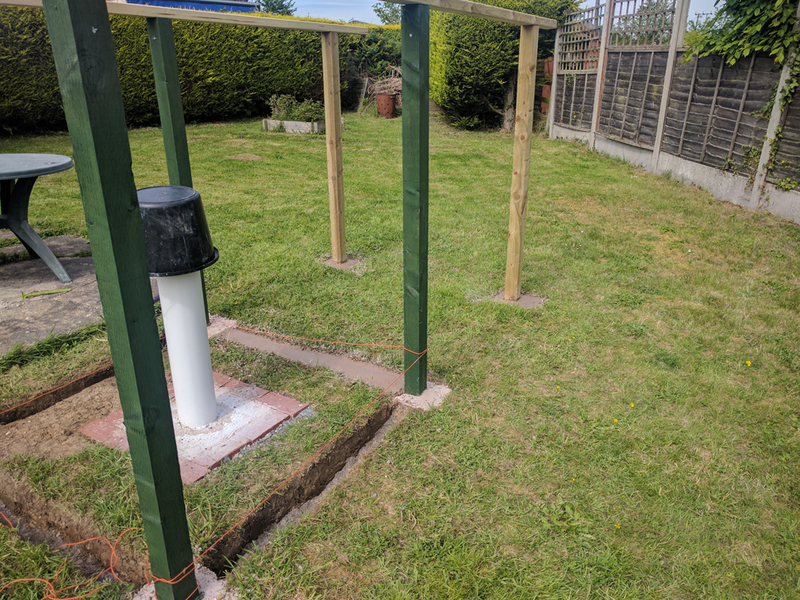 In this post, we’ll get started on the foundations and framework for my roll-off roof back garden observatory. 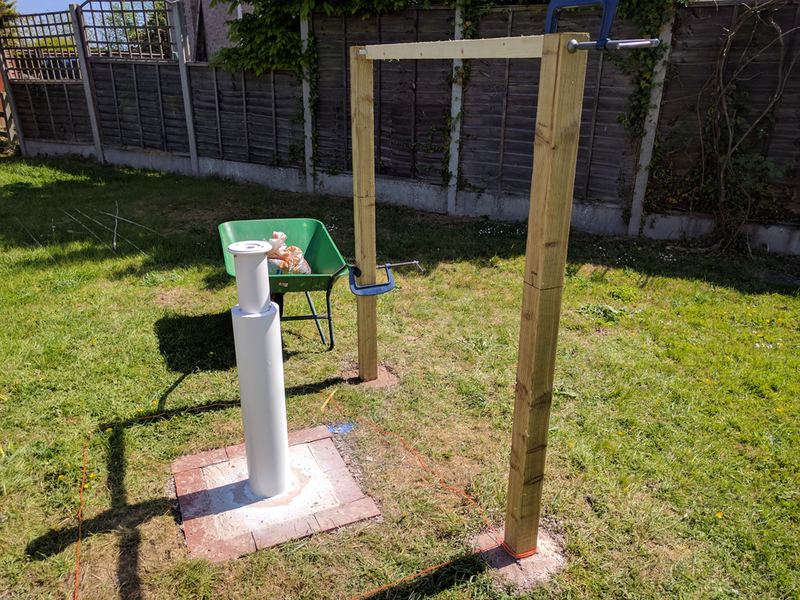 In the previous post, I finished building the telescope pier and now it’s time to enclose it. When planning this observatory, I considered a number of construction options. Many people buy a wooden, plastic or metal garden shed and then modify it. Whilst the price of a shed kit might seem high, in terms of materials it would be no more expensive than the timber for a custom build. The advantage of a shed is that a lot of the thinking and hard work has been done for you. If you can follow the instructions for screwing together the frame and panels, you’re halfway there. The disadvantages as I see them are firstly that the materials may not be the best quality and so you must spend time and money improving the strength, weatherproofing and longevity of the shed. The biggest drawback though is that most sheds get their structural integrity from attaching the roof to the walls. That’s not possible with a roll-off observatory, so you have to build an extra framework to support the walls and the roll-off roof. In light of this, I decided that a custom build was the way to go. As my carpentry skills are minimal, I based everything off six 75 x 75mm treated timber fence posts to ensure a sound structure and a good fit. 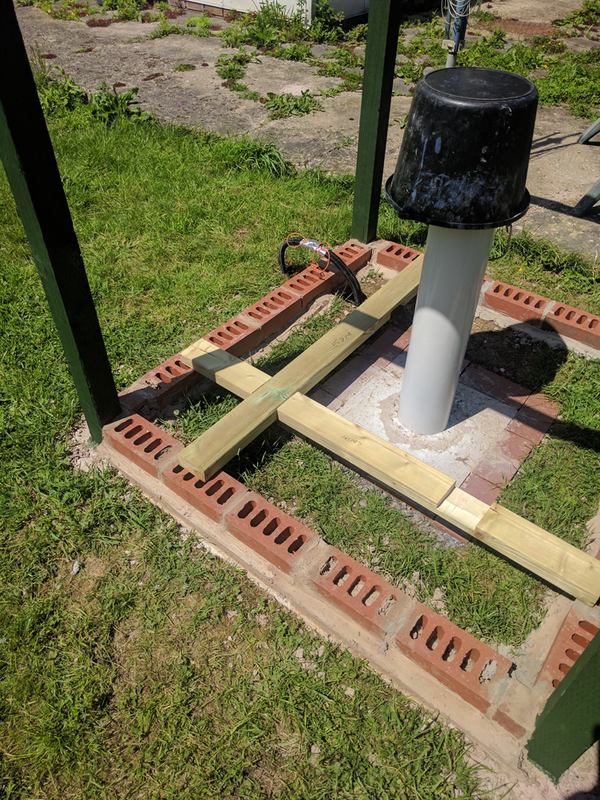 Setting the posts in concrete in the ground would ensure that, regardless of any poor joinery later, the observatory would not collapse or warp out of shape to an unacceptable degree. I re-measured the four corners of the observatory walls and marked them out with orange twine, ensuring that the centre of the pier was in the centre of the observatory. It is worth taking time to get this right by measuring the length of each side and also squaring by checking that the diagonals between the corners are of equal length. I didn’t get this spot-on myself, as one side of the observatory ended up a couple of centimetres longer than the other. It didn’t cause any major problems but would have done if the discrepancy had been much more than that. 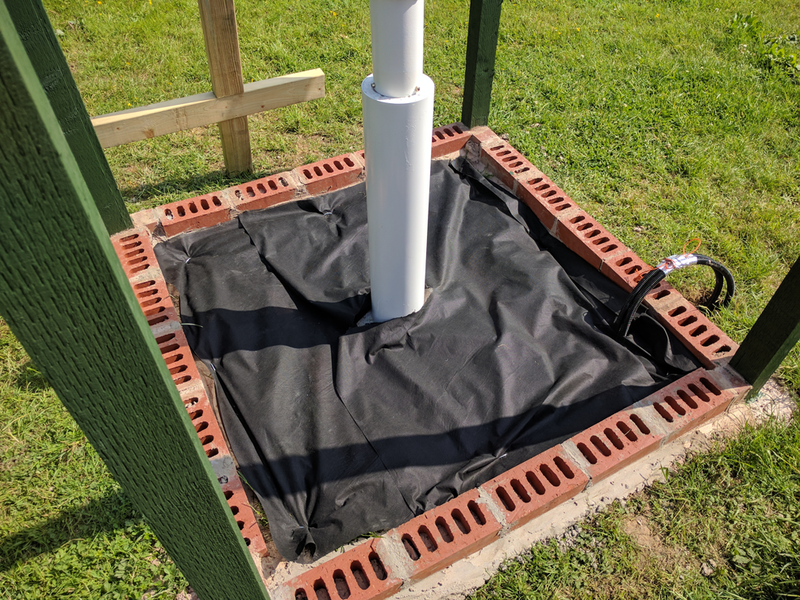 Next I dug a post hole as per the plans (see Part 2) and compacted a layer of sub-base in the bottom for drainage so as to prevent the fence post sitting in water. I then positioned the fence post and held it in place using a G-clamp attached to a weighted-down wheelbarrow. You could screw battens to the post to make a support framework if you prefer. 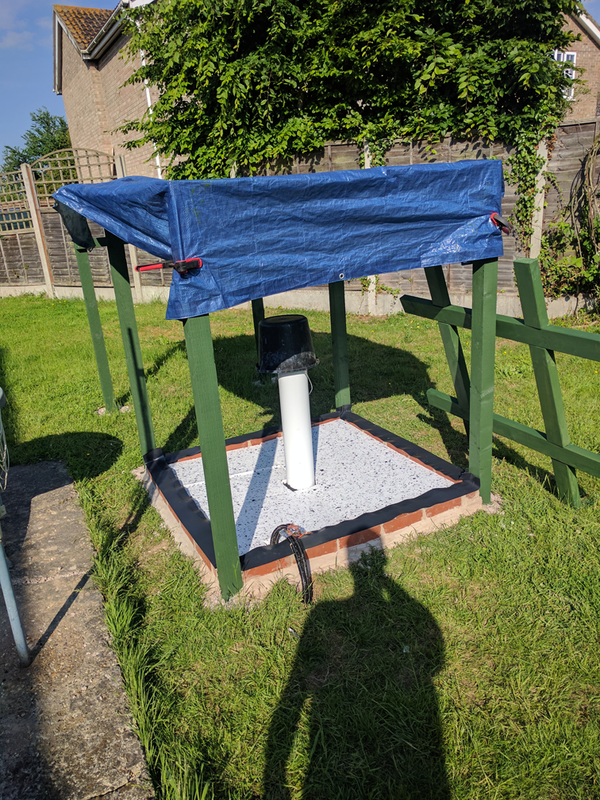 I then filled the hole with concrete, checking that the post was square with the twine and vertical using a bubble level. I also ensured that the top of the post was the correct height above the top of the pier foundation as per the plans. I left the concrete to set overnight, but if you are in a hurry you could use quick-setting postcrete instead. 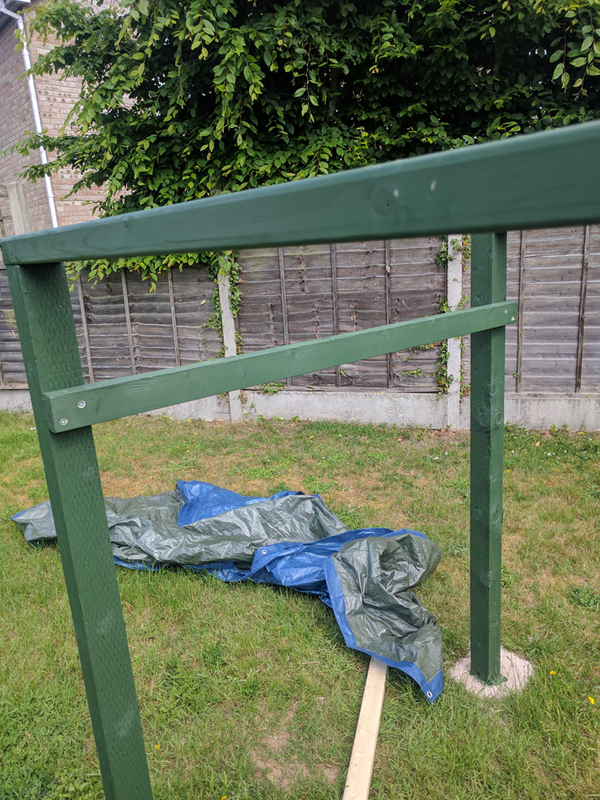 The next day I put in two more posts, this time also using horizontal battens that I had cut to length to help ensure the posts remained vertical and square to each other. Again I ensured that the tops of the posts were the correct height and level with the top of the first one. Once these has set, I put in the remaining corner post plus two more posts to support the roll-off roof rails. I also treated all woodwork with several coats of “Cuprinol Ducksback” as I proceeded. I wanted to ensure that any surfaces hidden by later woodwork still had protection against water ingress so as to prolong the life of the observatory. Now I dug out shallow foundation trenches for the observatory floor and filled them with concrete to level with the pier foundation. The load of walls and roof would largely be supported by the fence posts so there was no need to go overboard here. I laid a small duct under one of the foundations for the incoming electricity supply. This was made from a piece of square plastic drainpipe with two lengths of flexible electrical conduit running through it. 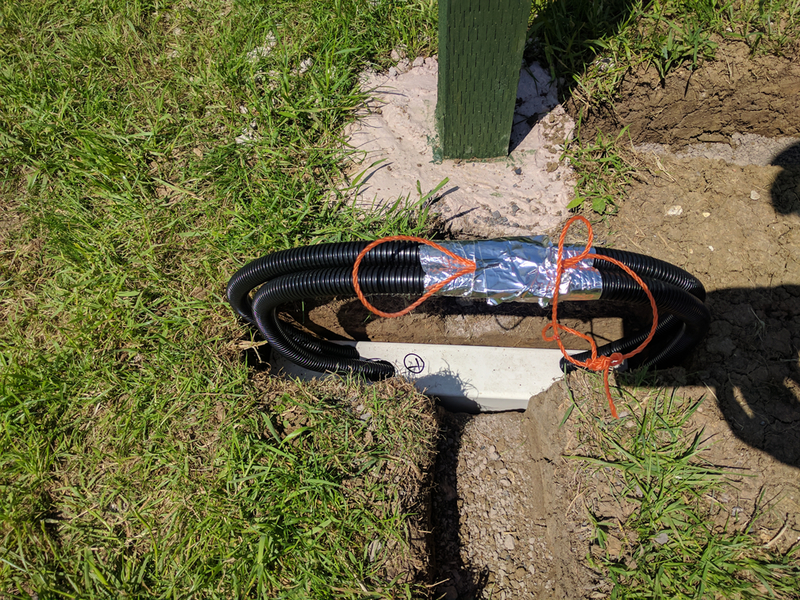 I threaded a loop of twine through the flexible conduit to help with installing cables later, and then taped the ends of the conduit together temporarily to keep out dirt and concrete. Once the concrete had set, I then laid a single course of engineering bricks using mortar. My brickwork ‘skills’ are non-existent, but I needed to make sure the top of the brickwork was level all the way round the four walls. To help with this, I set out a line around the corner posts at the desired final level, and also used large builder’s level to keep checking my progress. My site was reasonably flat to start with, but I did have to build up the mortar bed under the bricks more on one wall than the other due to a slight slope. I had decided that trying to level the whole site at the start wasn’t worth the effort, but this would obviously become necessary on a steeper slope. The next step was to build the floor support framework using 95 x 45mm timber. I made a simple frame out of four pieces of timber which sits on a damp-proof membrane set on top of the engineering brick course. I used an offset mitre saw to cut trenches in each piece to create ‘cross lap’ joints and then treated each piece before screwing the framework together. You could cut the trenches using a hand saw and a chisel, but it would be a lot more effort. Note that I laid the timbers ‘flat’ to reduce the overall height of the floor, thus allowing me to minimise the height of the pier. Normally floor joists are laid so that the thickest dimension is vertical for strength, but the small floor span made this unnecessary. I then fitted a layer of weed suppressing fabric inside the observatory floor, staking it down using weed fabric hooks. On top of this I put a layer of 25mm polystyrene insulating board cut to size. The damp-proof membrane was cut to length and held in place on the brick course by stapling it to the fence posts. The floor support framework simply sits on top of the damp-proof membrane. There is no need to fix it down in any way, as once the floor is screwed on top of the framework and the inner walls installed it cannot move. The next step in the basic frame was to add the wooden runners which would support the roll-off roof rails. Two of these were cut from lengths of 75 x 45mm kiln dried timber, treated and screwed to the tops of the observatory and roof support posts. The runners are three metres long and need to be straight and free from bends or twists. This is easier said than done when you are relying on timber picked and delivered by the supplier! Some of the other timber I was supplied with was distinctly banana-shaped and had to be cut strategically to extract the straightest parts. I’d recommend selecting your timber in person wherever possible. Later in the construction process, I decided to increase the amount the roof overhangs the walls, so the runners ended up being slightly too short to allow the roof to completely clear the observatory walls. This was easily rectified by adding extension pieces and supporting corner braces. (The plans I have supplied don’t suffer from this problem). Finally, I added a cross-brace to the roof-support posts to prevent them spreading sideways. The other four posts would be braced adequately by the wall framework. More corner braces might be needed for a larger observatory or a heavier roof, but so far mine has been rock solid without them. In the next installment, we’ll install the floor and frame and clad the walls.